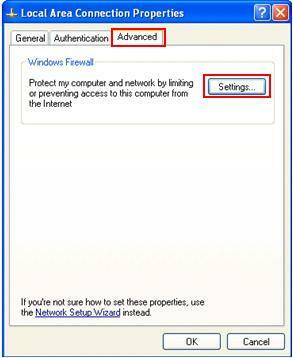 Here are step-by-step instructions on how to turn off Windows Firewall in Windows XP with SP2. However please don’t simply turn off the firewall unless you have other firewall installed. Disable firewall will make the computers more vulnerable to viruses and intruders in your home network. 1) Go to Start and click Control Panel. 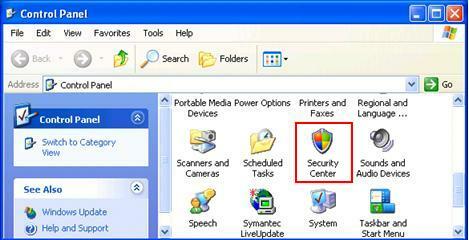 Control Panel window will appear, and then double click Security Center. 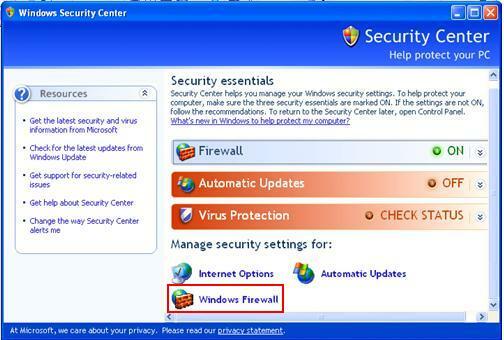 2) Windows Security Center window will appear, go to bottom of window and click Windows Firewall. 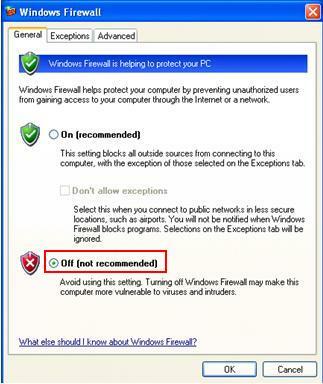 3) When you see Windows Firewall window, click Off (not recommended) radio button to shut down Windows Firewall feature on all the network cards. Click OK at last. Note: You can also disable the Windows Firewall from the network card’s properties window. Open your network card’s properties window, click Advanced tab and then click Settings, you can then disable the firewall on Windows Firewall window.